General of the Army Douglas MacArthur: An Address Delivered at Los Angeles, California January 26, 1955. Stanford Connecticut: The Overbrook Press, 1955. 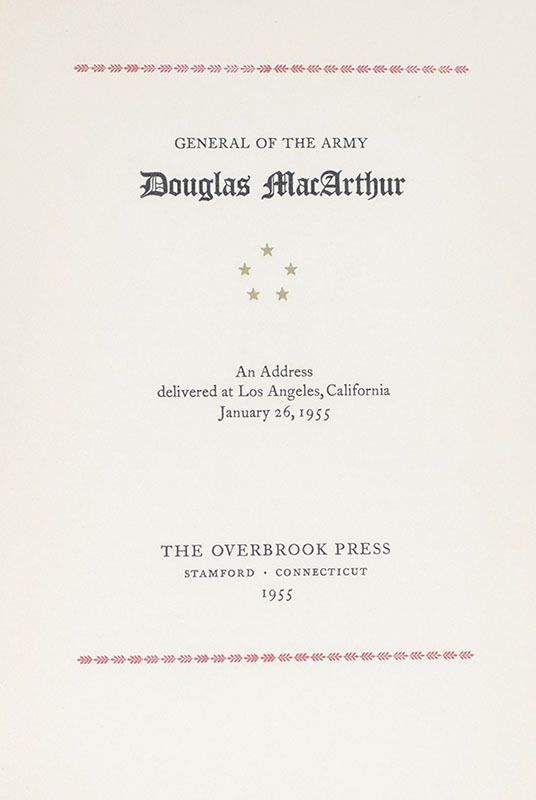 First edition of this address delivered by General Douglas MacArthur at Los Angeles, California January 26, 1955 in which he discusses the current state of the nation. Octavo, original wrappers as issued. In near fine condition. Scarce. Douglas MacArthur was an American five-star general and field marshal of the Philippine Army. He was Chief of Staff of the United States Army during the 1930s and played a prominent role in the Pacific theater during World War II. He received the Medal of Honor for his service in the Philippines Campaign, which made him and his father Arthur MacArthur, Jr., the first father and son to be awarded the medal. He was one of only five men ever to rise to the rank of General of the Army in the US Army, and the only man ever to become a field marshal in the Philippine Army. 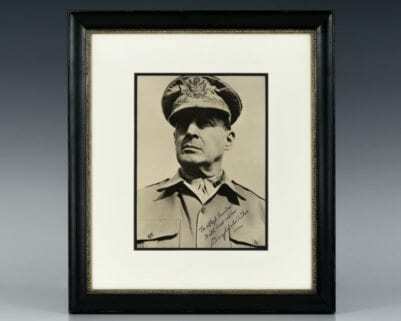 Large signed portrait of General Douglas MacArthur in uniform, “To Major Sgt. Gordon, with best wishes, Douglas MacArthur.” Double matted and framed. The entire piece measures 13.5 inches by 15.5 inches. New York: McGraw-Hill Book Company, 1964. 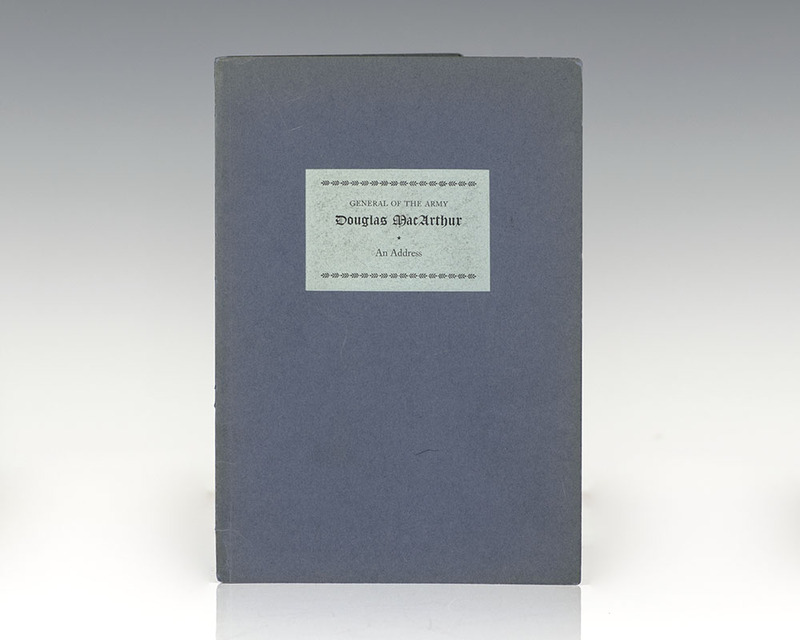 Signed limited first edition of MacArthur’s autobiography. Octavo, original cloth, illustrated, frontispiece. Signed by Douglas MacArthur, this is number 359. Near fine in a near fine slipcase. A nice example. 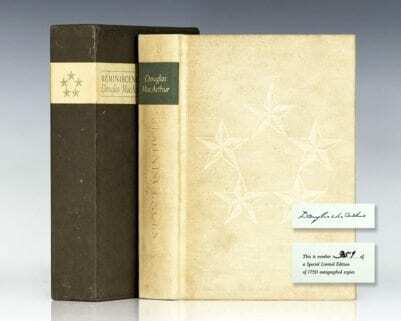 Douglas MacArthur Signed First Day Cover. First day cover boldly signed by General Douglas MacArthur. Dated February 3, 1948, the third anniversary of the entry of American forces. In near fine condition.